Friends for Our Riverfront: What's all the dirt about? What's all the dirt about? Beale Street Landing under construction. $7.4M of city money has been spent so far. $14.9M is requested in the City's CIP budget. The total estimated public cost is now at $33M. Click below for John Branston's May 15th "Flyer" article that takes a look at the project and cost overruns and for the RDC hand-out to City Council. 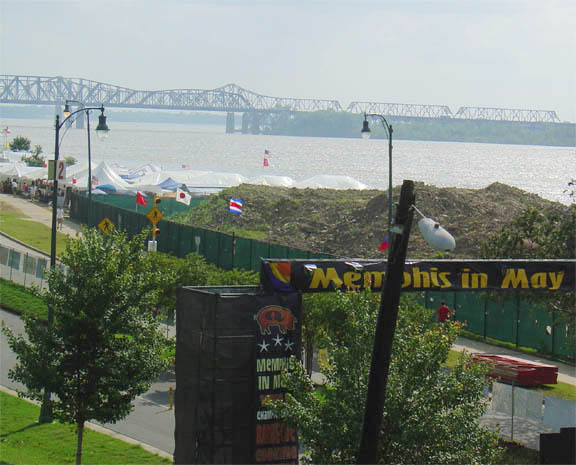 Three things are going up at Tom Lee Park this week: the river level, the fragrant smoke from the barbecue contest, and the cost of Beale Street Landing. The boat dock and future gathering place at the north end of the park, a pet project of the Riverfront Development Corporation and Mayor Willie Herenton, will now cost $33 million, according to the estimate provided to the Memphis City Council by RDC President Benny Lendermon this week. Like river stages in May, the cost keeps going up. When a South American architectural firm was chosen to design the fancy boat dock and gathering place in 2003, the cost estimate was $20 million. By 2005, the cost of "River Outlook" had risen to $27.5 million. In 2007, the number was $29.4 million. The $33 million includes $11.5 million in state and federal funds and about $22 million in local funds. Approximately $11 million has already been spent, which helped persuade some first-term council members to keep on funding the project that was approved by their predecessors. The cost of steel is one of the things driving up the price. When councilman Bill Boyd asked where the steel would come from, Lendermon said "maybe in Argentina." The architectural firm, RTN Architects from Buenos Aires, is being paid $2 million. Beale Street Landing is shaping up as a nice little stimulus for one recession-ravaged economy. Shovels ready, amigos! The landing will include, among other things, "floating" docks that will allow visitors to get finger-dipping close to Old Man River. In RDC mythology, this "touch the water" experience is not presently possible. Leaving aside the question of how many people actually want to do this and whether it is worth $33 million, the fact is that the partially submerged cobblestones landing and Greenbelt Park across from HarborTown are currently suitable for water-touching, fishing or full-immersion baptisms 30 yards from the sidewalk. The meaning of the landing part of Beale Street Landing has been revised. The overnight river cruise lines that used to dock at Memphis -- Delta Steamship and Majestic America -- have gone out of business. Lendermon now says the "world-class" landing was designed for the homemade vessels of the Memphis Queen Line. "The use of facility, for boating side, has always been the local excursion boats," he told council members. That does not include canoes and kayaks. So where did anyone get the idea that the landing was for big, overnight cruising boats? From the RDC, actually. The riverfront master plan approved by the council in 2002 specifies "a landing designed to accommodate the largest commercial riverboats and facilities for passengers with luggage." 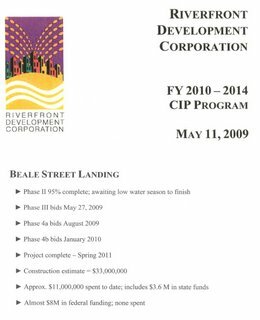 In an interview in 2005, Lendermon said the landing was needed because "the Delta Steamship Company is close to refusing to dock at Mud Island." The RDC website says a modern docking facility is needed because "approximately 50 stops are made by three major vessels each year, and this does not include local excursion boats." It also says "the Delta Steamship Company has increased its dockings in Memphis by 40 percent. They are trying to build their market here in anticipation of the new docking facility." Finally, the budget summary given to the council this week calls for "a docking facility for touring and excursion boats." The next phase of Beale Street Landing will be bid May 27th. The project, which will add four acres to the park, is supposed to be completed in the spring of 2011. The full council still has to approve continued funding, but a halt to Beale Street Landing at this stage of the game seems unlikely. 2010 Proposed RDC CIP Budget. Click HERE.